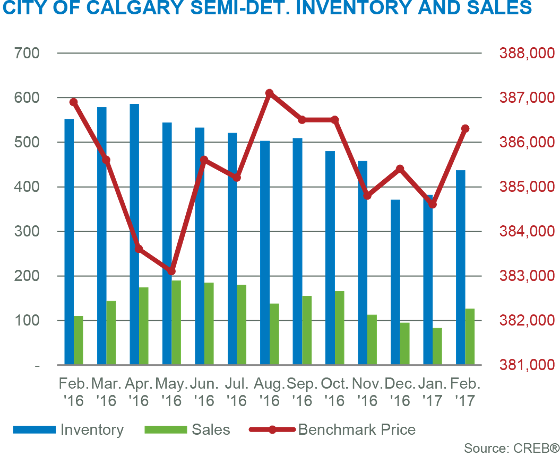 Two months into the year, Calgary’s real estate market seems to be experiencing a noticeable shift in momentum, with a consistent rise in optimism and a slow and steady return to more balanced numbers across all sectors. 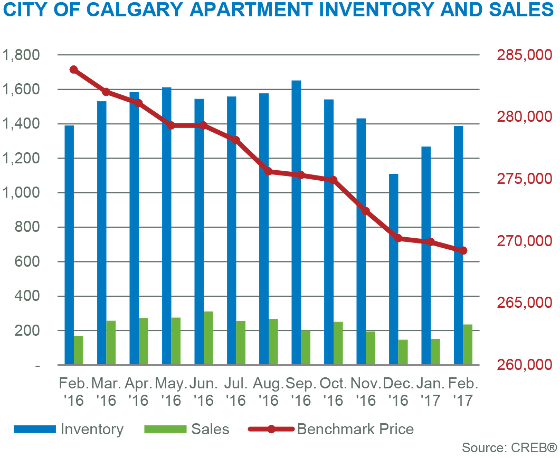 February sales totalled 1,342 units, which is still 19% below historical averages, but an improvement over the past two years, hinting that worst is behind us and the Calgary market may finally see some much needed improvement. Throughout the month of February, our team saw a surge in the market, with strong sales and plenty of showing activity on our listings throughout most sectors. With a limited number of new listings hitting the market in the past two months, inventory levels in most market segments remain low. The lack of selection is especially apparent in new homes priced under $850,000 where demand is high and options for buyers are few and far between. We anticipate more new listings will hit the market in the coming weeks, hopefully lending more options and a greater selection of properties as we head into warmer weather and the usual Spring Rush. 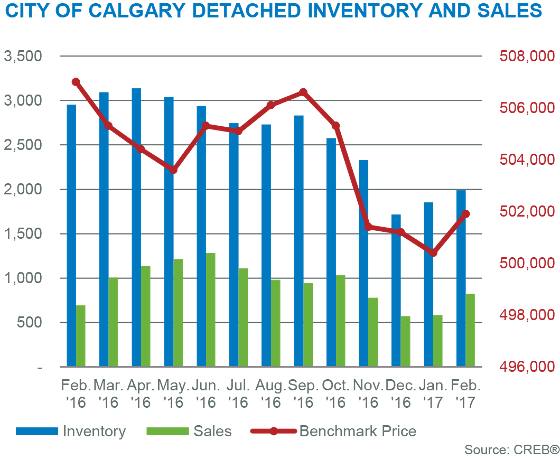 Keeping with the trend seen throughout the past several months, the detached market continues to show improvement, with notable declines in inventory and many price ranges showing inventory levels comparable to stronger years past. With sales up 19% and new listings down 19% compared to February of last year, months of supply has gone from 4.26 to 2.41, firmly levelling off the market and nearly tipping the scales into sellers market territory in certain markets. Although benchmark pricing is still down year over year, we expect to start seeing modest price gains moving forward. February semi-detached sales totalled 127 in February, a 15% increase compared to last year and another sign that a stronger market is on the horizon. Improved sales combined with 16% fewer new listings compared to the same time last year helped to bring months of supply down to 3.44 from 5.02, placing the majority of the semi-detached market in a balanced state - especially in the inner-city infill markets. Despite substantial improvements in all other sectors, the townhouse sector remains fairly flat comparing to February last year. The only sector to see a year over year decrease in sales activity (albeit a very modest 3%), the townhouse market did see a 7% reduction in new listings which helped to bring a very minor improvement to months of supply, from 4.96 to 4.41. Despite a sluggish start to sales improvement in this sector, we are still optimistic about activity for the remainder of 2017, although pricing may not see improvement for some time yet. Showcasing the most notable improvements of all sectors on a year-over-year basis, the apartment market seems to have finally turned the corner in February 2017. Sales are up by a whopping 40% comparing to the same time last year, and with new listings down 8%, months of inventory shrunk from 8.27 in 2016 to 5.88 in 2017. While still technically a buyer's market, we are hopeful that market conditions will balance out over the next 3-6 months in most price categories and we will see this sector finally level off in 2017. 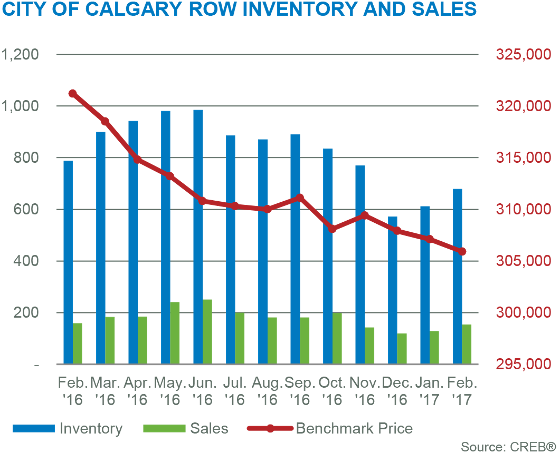 Continuing the trend seen overt the past 6 months, the new infill sector has shifted from heavy supply to record low inventory levels across most price categories. This has left new home buyers with very little to choose from, especially in entry level price points, where inventory is almost non-existent. Although builders have resumed their search for land and many now have numerous projects underway, the lack of completed home inventory is causing a fairly large gap in the market which may start to result in modest price improvements if conditions persist.